A sprain is the stretching of ligaments beyond their normal range of motion, which may result in partial or complete tearing of the ligaments. There are different types of ankle sprains, including the inversion, eversion and high ankle sprains. 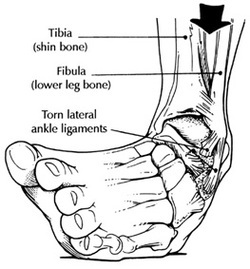 The most common is the inversion ankle sprain, which affects the outside (lateral) part of the ankle. An ankle sprain may present with swelling, redness, warmth, inability to move the joint or weight bear, and bruising, depending on the grade/ severity of the sprain. A Chiropodist can assess and grade the sprain, immobilize the foot, provide information to reduce inflammation, prescribe anti-inflammatory medication (NSAIDs), tape the foot, and provide rehab exercises.